Developed by Gameforge for Internet browser. Gladiatus is a browser based that takes place in Classical Rome. Play as a rogue Gladiator who is free to explore the wilderness beyond Rome, participate in the Arena, and complete odd jobs for the local tavern keeper. Battle fierce monsters on long expeditions, train your stats, and compete to be the highest ranked gladiator on your server! In order to equip themselves and earn enough gold to train their stats, players must complete quests and fight monsters outside town. 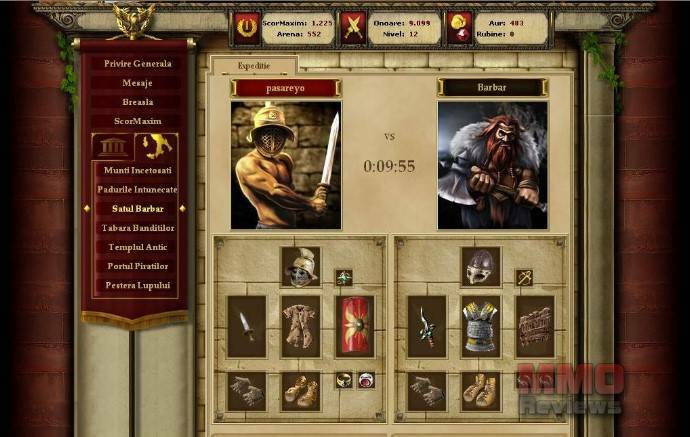 Gladiatus is a slow paced game where each combat encounter takes 10 or more minutes to resolve themselves with no player input. This is an ideal game to play on one tab while web surfing or working on the other. The game world is broken into two main areas, town and the wilderness. Town Locations - Work, Arena (PvP), Tavern (quests), Training, Weapon Smith, Armor Smith, General Goods, Alchemist, Jeweller, Auction House, Market. Wilderness Locations – Hermit, Misty Mountains, Grimwood, Barbarian Village, Bandit Camp, Ancient Temple, Pirate Harbor, and Wolf Cave.